I spent 9 hours administering the Stanford Achievement Test to eight 3rd graders this week. I’m not super happy with how it all went down on behalf of my own 3rd grader. More on my revised thoughts on standardized testing at WORLDMag.com. Once upon a time (21 months ago to be exact) I wrote about all the reasons why we decided to have our kids participate in standardized testing every year. For the most part, I still believe all of those reasons to be valid ones . . . for some of my kids. But after administering the test to eight third graders this week, one of them my own, I’m no longer convinced this is the best way to evaluate all of my children. In fact, I’m quite convinced that the results we get back will do very little in the way of giving us an objective analysis for her. You see, the daughter in question has a slight reading delay. She has adapted to this very well by becoming an amazing auditory learner, but when asked to read something and then respond to it, it’s a struggle for her. The test she took this week required a lot of reading for all subject areas-the standard reading comprehension, of course, but also math, science, and social studies. We won’t really find out what she knows about problem solving, science ideas, or geography. Instead, we will just have our knowledge of her reading delay enforced as we see how it affected all of these other areas. Had I been able to read all of the questions to her slowly and given her more time to process the answers, I’m confident we would see much different results. This isn’t just a concern for this particular daughter. I noticed the same trend in about half of the children I tested this week, and I’m guessing the same is true for kids in traditional school settings. Test results can be a helpful tool in the right setting and for the right kids. But for some there needs to be an alternate form of objective analysis that is weighted just as heavily as the standardized test would be for children who test well. Until something is figured out, though, there will continue to be discouraged kids taking tests all over the country. And what we find out about them won’t really tell us all that much about what they actually know and understand. Honestly, I find the graphics in this video to be quite distracting (I couldn’t find another version of it anywhere), but I absolutely LOVE the song. I tried find it on iTunes so I could just download that one, but instead ended up ordering the entire album from Amazon. I’m really looking forward to its coming. I’m not surprised I like it so much. I was a PFR fan before being a PFR fan was cool and I have two of Joel Hanson’s solo albums. Sara Groves is a more recent addition to my library (as in within the past couple of years) but I really like her too. This song is a win! Speaking of laying my burdens down, I wrote about prayer today for WORLDMag.com. In this case it’s more of a lifting up rather than a laying down, but the point, I believe, is exactly the same. A few weeks ago at the weekly homeschool group I direct, one of the families shared a creative way they make prayer “real” for their little kids. 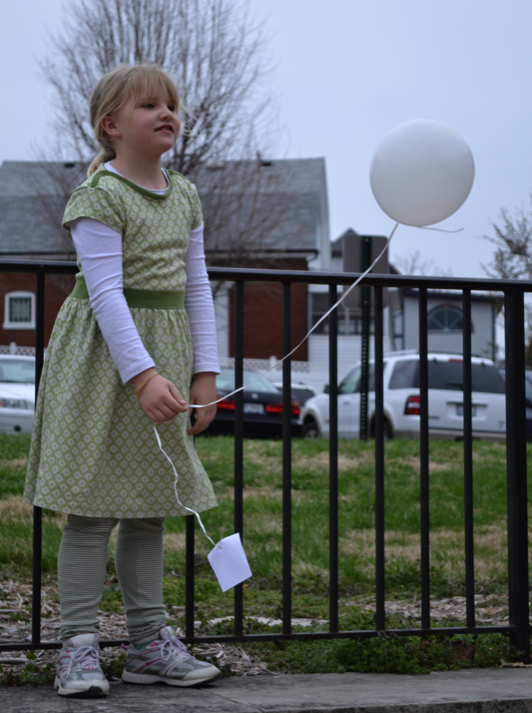 They take a piece of paper, write their request on it, and attach it to a helium-filled balloon. As they release the balloon into the sky, they say a prayer for that need. Over the lunch break, this family passed out balloons to all of the other families so we could offer our own “visual prayer” to the Lord. Now lunch for our group is an understatedly busy time for me, so I took the balloon they offered and proceeded to carry it around for about an hour-and-a-half before I even realized I had a balloon following me. Eventually, I started to get asked if I planned to do anything with the balloon. My response: “I’m going to get to it later.” It was then that I realized I was doing with the balloon what I do with most of my prayers-carry them around thinking I’ll eventually do something with them. How much easier would it have been had I just gone outside and released the balloon on the spot? How much easier might some of my burdens be if I would just let them go? I say I am dependent on the power of prayer, but the truth is I’m dependent on the power of me most of the time. I eventually turn to God in prayer only when I prove to myself that I really can’t do it. Thankfully, God’s faithfulness isn’t dependent upon my verbal requests; He knows my heart and meets the needs I don’t even know I have. It was about 3 p.m. before I (along with my kids) actually took the balloon outside to offer up a request. By then the balloon was no longer floating as high as it was at noon, and I was mildly concerned it wasn’t even going to make it up in the sky at all. Still, we prayed and lifted the balloon up as high as we could, even giving it a punch to send it up a little higher. Imagine our surprise when it continued to lift-slowly, steadily, surely. Did we need the balloon to make sure God heard us? No. But the visual reminder that God can take a half-deflated request and receive it as an expression of desperate dependence on Him was not lost on me. I’m thinking about buying my own helium tank so I won’t forget. Looking for a Cure for Bieber Fever? 90% of girls all around America would cry if Justin Bieber were about to jump off of a 20-story building. If you are a part of the 10% who would be sitting in a dual reclining loveseat with popcorn yelling, “Do a backflip!! !” send this to as many people as possible! Everybody,I do not like Justin Bieber, but we must remember that he is a human being too! He is also created in God’s image. And even though he is a bad role model, we don’t have to say that we wouldn’t cry when he jumps off a building. We need to know that he was born on this earth just like everyone else (even if some people think he is a weird alien.) We don’t need to hate him, but please, we also don’t need to go ga-ga over him like everyone else does. Oh, and Tracy, I don’t really like his music, but I’m okay that you do! Before sending the message, she asked me to come in and take a look at it. I read it over her shoulder, offered one spelling correction, and said, “Send it!” So she did. I walked away from the computer smiling because this email exchange is a turning point in the way this particular daughter expresses her thinking on all things tweeny-bopper. For better or for worse, we, as her parents, have worked to give her a sense of what we believe to be truly good music and encouraged her to not just follow hard after what all her peers say is good music. Granted, the definition of good music is up for grabs these days and probably varies for every single one of us, but just like Hannah Montana and the entire repertoire of High School Musical, Justin Bieber hasn’t made our family’s list of quality music. Initially, our encouragement instilled a sarcastic vibe in our daughter regarding said pop stars, which resulted in an almost hyper-hate-alternative response to her friends with Bieber Fever. Out of her need to make sure everyone around her knew she didn’t obsess over the boy, she tended the other way, making sure everyone knew how much she disliked him. We’ve had to backpedal on more than one occasion on things like this as she went off on one of her “that music is sooooo stupid” rants. We’ve had to remind her that while we may not enjoy his music or agree with the direction his life is taking, we can still find ways to treat him with the respect he is due simply for being another human being made in the image of God. In short, we’ve asked her to stop talking about him all together if she can’t think of anything kind to say at all. It had been several weeks since our last Justin Bieber talk, so when she called me over to the computer to take a look at what she was going to say, I was really surprised to read it. And as the emails that followed after her were along the lines of, “You know, you’re right,” I’m thankful for her newly found sensitivity to put an end to the potential slander she once would have otherwise pursued. Discernment is often more caught than taught. And yes, sometimes our kids are listening. So I started tell you about our big new change here. And then Craig filled in the major detail here. And then I came back and told you how he told me here. Today I tell you how we told the girls here at WORLDMag.com. For the record, this weekend was pivotal in her life, but we still have a rocky road ahead. We’re preparing for it. The last time we made a major state-to-state move our oldest child was just 6 and our youngest 18 months. When we told the girls we were moving back then, there was some sadness from the 6-year-old, but it was short-lived and easily compensated. The others didn’t really care so long as we packed their special blankets and toys. Fast-forward six years: My husband, Craig, has just accepted a new position as head of school at Veritas Classical Academy in Oklahoma City. While our girls had known for several weeks that the move was a strong possibility, the official offer came one week ago today. As we were eating dinner that night, Craig asked each girl for her honest thoughts about the opportunity, as we would give serious weight to their thoughts on the matter. One by one the girls started telling us about all the things they love about life in St. Louis and the people they would miss. One by one they all said that while they were sad to move and leave their friends, they were a little excited about the change and the possibility of having their own rooms. All of them were excited, that is, except one: Our second-born definitely was not OK with the change, and she said so in so many words. After dinner, Craig and I talked about his last-minute plan to fly to Oklahoma City one more time to meet with the board. We had one frequent-flier plane ticket for him to use, but I looked at him and said he should think about taking Chloe with him. We both realized that some daddy/daughter time was what she needed, but because we didn’t have a second free ticket lying around, this meant driving the 16-hour round-trip so she could go with him. The next day, after teaching all day and coaching baseball practice that afternoon, Craig came home, ate dinner, packed up, and headed off to Oklahoma City in the pouring rain with our 10-year-old daughter who desperately needed a dose of stability and security. That was exactly the point. I know she will continue to struggle through the process of our transition, maybe more acutely than any of the rest of us. But I hope she knows in her core that we understand and will walk her through it every step of the way. We are no longer cat owners. I wrote about the process of handing the cats off to their new family today at WORLDMag.com. For a variety of reasons, our family said good-bye yesterday to a trio of 7-year-old cats: Ricky, Lucy, and Ethel. These cats were with our family for two years and were good kitties, but we discovered in the course of those two years that two of us are allergic to cats. We also discovered that they didn’t get along very well with the puppy we acquired last August and, frankly, the puppy won. But that grace didn’t make the process of saying good-bye any easier. The girls were spending their last moments with the cats yesterday when the doorbell rang, and within 20 minutes it was all over. The family was very kind to walk out after we arranged the cats in their various carriers so the girls could say their last tearful good-byes, and I gently encouraged my daughters to carry the cats out to the waiting family rather than have them come back in to get them. I thought it would be better if we physically handed them over to the family instead of having them take the cats from our house. The girls were willing, but they were also wailing. We came back inside and I gathered my weeping daughters around me. Their sadness made me cry as well as my heart was heavy because of the pain they were feeling. My first impulse was to help them get their mind off of their loss and I came super-close to taking them out for ice cream, because, well, ice cream always helps, right? I thought better of it . . . only to entertain the idea that maybe a video would help. Again, I realized that numbing the pain with something digital might not be the best way to go either. The girls didn’t question me and prepared to go outside. My husband pulled into the driveway just as we were heading out, noticed all the red eyes, and didn’t even go in the house; he just joined us in our lament. We spent 20 minutes decompressing what we as a family had just experienced, and what began in silence-sisters crying and holding hands to comfort one another-ended with giggles and mini-races back to the house. The immediate pain was soothed without the help of sugar or cartoons. It was good resolution. I just wrote about the best thing to ever happen to Craig for his birthday over at WORLDMag.com. Hint: It has something to do with a certain 9yo in our house. This past Saturday my husband turned 40. For his birthday we drove through the latest St. Louis snowstorm to a pre-screening of Gnomeo and Juliet. Sounds like a great way to spend your 40th birthday, right? In Craig’s case it totally makes sense because it wasn’t just his birthday, it was our third daughter’s 9th birthday as well, and she was thrilled to see a movie in a theater on her birthday. Having Katie born on Craig’s birthday was the best thing to happen to him; he hates attention on his birthday and always has. When he turned 30, I threw a major surprise party for him that packed 60-plus people dressed in 1980’s garb into our small house. It was super fun and he really did enjoy it, but when it was over he gently asked me not to ever do it again. I promised I wouldn’t. Katie was born on his birthday the following year and ever since, the birthday focus has been on her, which is just the way he likes it. Anyway, my younger two girls and I attend Classical Conversations one day a week, and each week every child gets to practice public speaking by giving a presentation to his or her class. As the director checking in on the morning’s classes, I happened to walk into Katie’s class right when she was giving her presentation and just in time to hear her explain to her class how her birthday was on Saturday. Katie showed them one of the gifts she received and explained how she shares her special day with her dad. I then heard her pronounce confidently to the whole group, “My dad says I’m the best thing that ever happened to him on his birthday!” She was beaming as she said it, and she said it because she believes it. She believes it because she has full confidence in her father that he means what he says and she will always know in the core of her being that she really is the best thing that ever happened to him on his birthday. Having daughters who know and feel secure in their position in the life of their dad is one of the best things that’s ever happened to me. As much as I try and as much as I want to be an important influence in their lives, I simply can’t do it alone. I’m not at all saying Craig is a perfect dad. He makes mistakes just like the rest of us, but he is very intentional about investing relationally in the lives of our girls and they know that. I love that he is such a great influence in their lives, and I love that they rest in that. Millie coined a new term for us yesterday that I’ve been thinking about ever since: unplayed snow. I’m talking about that over at WORLDMag.com today. The conversation that followed between her and her 8-year-old sister centered on how tragic it was that such a large patch of their favorite thing was right there and nobody had either been allowed to play in it or had bothered to. I’m not sure which was the worse sin in their estimation, but the sentiment struck me as being semi-insightful. I think my “too-much detector” has indeed malfunctioned. When was the last time I was dismayed by a lack of unutilized resources, be they natural or creative or otherwise? I stay so focused on doing, doing, doing and on the monotony of the mundane that I forget the process of being, being, being and the pleasure of play. My kids know the value of unplayed snow; I seem to just know the nuisance of it. I’ve had one specific child begging me to take her sledding for the past four days. I really don’t like the cold and do my best to stay out of it as much as I can, so I’ve avoided her request with one legitimate excuse after another. But I’ve also avoided looking her in the eyes as I’ve made my excuses, and that call to enjoy the unplayed snow is echoing in my ears. I’m setting out the snow pants tonight; tomorrow, I’m going to answer it. I’m serving it up light and fluffy today at WORLDMag.com with some commentary in defense of the cookbook (with props to Lauren Winner). I also share the one cookbook I’d take with me to a deserted island should that dreaded (or blessed, depending upon your perspective) event ever take place. What would be your cookbook of choice if you had to choose only one? I feel her pain. I just glanced over and counted my own collection of cookbooks: I have 50, and this is a pared-down number. Yet I’ve still been guilty of turning to the search engines when I’m in a pinch; it seems much faster to search for a recipe this way than by pulling out a cookbook and hoping it has the answer I’m looking for. But when there are 5,000 variations on a theme (and usually there are many more than that), I want something trusted. That’s when I usually default to Fannie Farmer. Fannie Farmer isn’t perfect, no. There are two recipes with penciled X’s through them so I know not to make that mistake again, but her imperfections make her all the more endearing to me-almost like she’s standing beside me in the kitchen giving me cooking lessons. She taught me to make a pie crust from scratch; she taught me how to make homemade rolls; she’s always there when I’m curious about a certain cut of meat and just exactly what is it I’m supposed to do with it anyway. The extension to the rest of life is pretty easy to make. Just as I’ve been guilty of doing a quick search when I’m looking for some specific recipe, I’ve done the same with relationships, looking for friends and community on my own terms and at a time of day that’s convenient for me, when I know the better thing is just a phone call or cup of coffee away. The vetting process Winner alludes to is an important one when it comes to all things internet-related-it saves us from a bad pot roast as well as potentially shallow relationships that are accessible but not necessarily healthy. It’s that time of year again – time to explain to most people why we opted out of teaching our kids to believe in Santa Claus. I wrote about it over at WORLDMag today. I grew up believing in Santa. There are many photos of me through the years sitting with my older sister and a variety of jolly old men with long white beards wearing red velvet suits. Though clearly terrified in one or two of these photos, the rest prove I managed to reconcile myself to believing in the man with the magical sack of toys and his amazing flying reindeer. Fast forward to a summer vacation in which we visited some extended family members. I remember where I was sitting in my cousin’s house the day he informed me that Santa wasn’t real. The image of that moment in time is burned in my memory, as what I had been told as truth suddenly wasn’t true anymore, and I wondered what else in life was a lie as a result. When I had kids of my own, I decided early on that I didn’t want to deceive them into thinking there really was a magical man who would bring them whatever they asked for. Our kids have never believed in Santa, but my husband, Craig, and I haven’t promoted an anti-Santa protest, either. We taught the girls from the beginning that he (the Santa of our current culture) is a made-up character that began from a kernel of truth about one generous man. The position we’ve taken hasn’t been the most popular in our social circles. We are usually viewed either as Scrooges for not embracing the Santa culture or as borderline pagan for even giving Santa some face time through decorations in our home. It never occurred to me that a third way of doing things could actually be a redemptive one. This issue has been our primary one as well and I think Driscoll makes a great case for truth-telling with our kids. The entire article is worth a read through if you have the time. So this Christmas, if one of my kids spills the beans to one of yours, my humble apologies. They may just be trying to redeem the culture of Santa as their parents are.